Since Acura’s compact luxury sedan was partially redesigned for the 2018 model year, receiving the brand’s now-signature Diamond Pentagon Grille amongst other styling and technological enhancements, very little changes have been made to the TLX for 2019. It notably competes against the Buick Regal, the Genesis G70 and the Volvo S60. As before, two powertrains are available. The base engine is a 2.4-litre inline-four that develops 206 horsepower and 182 pound-feet of torque, matched to a dual-clutch eight-speed automatic transmission, a front-wheel drivetrain and a four-wheel steering system. A 3.5-litre V6 with 290 horsepower and 267 pound-feet of torque is also offered, which is connected to a nine-speed automatic and all-wheel drive. All versions of the 2019 Acura TLX get what the brand calls an Integrated Dynamic System, a drive mode feature that includes selectable Econ, Normal, Sport and Sport+ settings. The Sport+ mode allows for higher shift points and downshift rev matching for a racier driving experience. Three trim levels—base, Tech and Tech A-Spec—are offered with the smaller engine as well as with the V6 and SH-AWD combo. The latter can also be specified in Elite and Elite A-Spec variants. The A-Spec badge adds a sportier exterior appearance with a blacked-out grille, sportier front and rear bumpers, round LED fog lamps, a black decklid spoiler and dark grey 19-inch alloy wheels. For 2019, the front-wheel-drive versions of the Elite and Elite A-Spec have been eliminated. Leatherette seat upholstery is featured in the base versions of the TLX, while Tech and Elite variants get perforated Milano leather, with contrast stitching and seat piping in the Elite. The A-Spec versions benefit from a mix of black leather and Alcantara, or full red leather seating. Standard features include a 10-way power driver’s seat, heated front seats, a windshield de-icer, LED headlights, a power sunroof, a remote engine starter, an intelligent key and adaptive cruise control, while a heated steering wheel, heated rear seats, ventilated front seats, a 360-degree camera system, wireless phone charging as well as front and rear park sensors are all available, according to the trim level chosen. Apple CarPlay and Android Auto integration is standard in the 2019 Acura TLX, as is Active Noise Cancellation that reduces road noise inside the cabin. Uplevel versions can be equipped with a 10-speaker ELS Studio sound system, a hard drive for media storage and a navigation system. As for advanced safety features, the TLX gets a Collision Mitigation Braking System, forward collision warning, lane departure warning, lane keep assist and Road Departure Mitigation, and all but the base trims also receive a blind spot monitoring system. 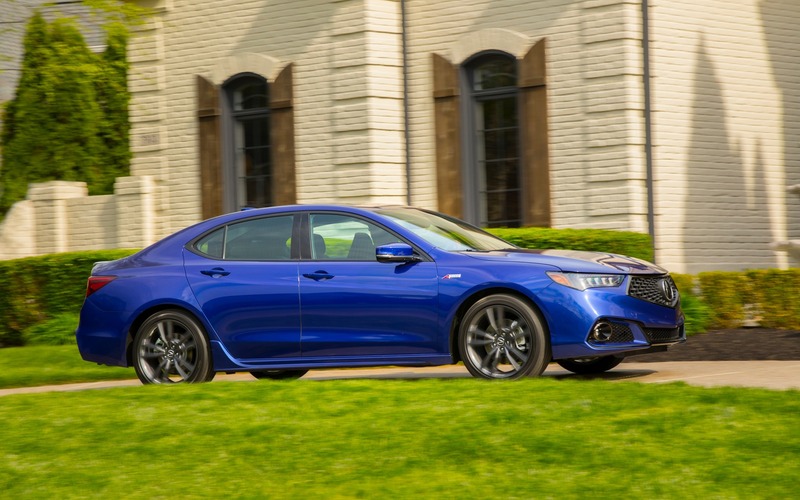 The 2019 Acura TLX starts at $36,190 before freight and delivery charges of $2,045, while the TLX SH-AWD is available from $41,190. A fully loaded TLX Elite A-Spec SH-AWD variant retails for $51,690.